Vanessa Neshevich and Amanda Tamane have forged a decades-long, rock-solid friendship based on their mutual interests—namely, witchcraft and cannabis. 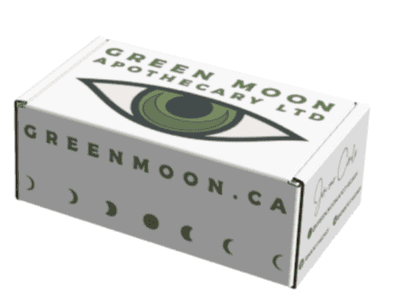 They finally decided to combine the two in a wickedly clever venture, Green Moon Apothecary, which delivers a carefully curated witchy wellness subscription box eight times a year, one for each Sabbat. Green Moon Apothecary integrates green witchcraft into spiritual practice, all with a hefty dose of cannabis-infused self-care. Their aim is to provide you with an accessible and delightful exploration into the wild and wonderful worlds of spirituality and cannabis. We caught up with Vanessa and Amanda to learn more. SDTC: How did you first meet? And when did you know that you had a shared destiny? VM: Amanda and I met in kindergarten. Amanda moved onto my childhood street in Oshawa and we were instant pals! Even from a young age, we both were attracted to the weird and wonderful. We would romp through the woods and our neighbourhood, creating our own mystic worlds and rudimentary spells together. As we grew older, our bond of friendship continued to flourish as did our common interests. This included both cannabis and modern witchcraft, along with the goal of being as free as we can possibly be. Thirty years into our friendship, we realized that it was time to stop talking about our common goal of being our own bosses and just do it! Our sister-like shared history allows us to communicate as business partners in a unique way, as we both had always wanted the best for each other. We always lift each other up, even when disagreeing. We’ve seen each other at our highest of highs (no pun intended) and lowest of lows, so creating a business partnership, knowing that we can get through anything together, was an easy evolution for our strong bond. AG: I think when we first met, our number one goal was to convince our parents that if we stuck together, we should be allowed to roam the neighbourhood on our own, with no older siblings to supervise! We’ve had that same adventurous spirit ever since. I think deep down we’ve always known that if we just watch each other’s backs, there’s nothing we can’t take on. What was it that made you want to start Green Moon Apothecary? 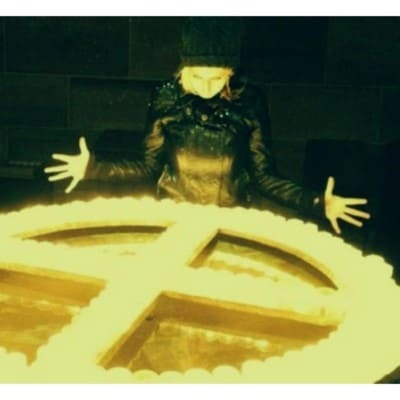 V: I enjoyed participating in various fringe communities and exploring different avenues of spirituality and paganism, marrying them with my passion for the wellness and spiritual benefits of cannabis. 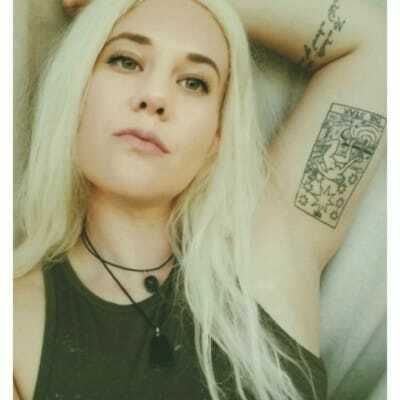 Amanda, who is a hereditary witch, dove deep into her Northern roots and has embraced her passion for runes and spellcrafting. We both had always naturally incorporated cannabis into our practices and we knew many other people, both witches and people within wellness communities, that also did the same. We realized there wasn’t much out there for the modern witch that combines ritual work with the holy herb, so we decided to create a curated Sabbat box service for people who lean towards alternative spirituality and wellness practices. A: Green Moon really brings together so many of our passions in an incredible way. Each of us is learning from the other, and we’re excited to bring that exchange of knowledge and experiences to the community at large as we expand our circle. Can you each please briefly describe what your relationship is with cannabis? V: My first time using cannabis was in high school. I used it purely recreationally, but I knew from my very first toke that I would have a lifelong relationship with it. Using cannabis allowed me to see the world in a different light. Plus, it was a great bonding experience within my circle of friends. I use cannabis medicinally now to treat my anxiety and to help me relax, as I am a very high-strung person. I also use it to enhance my wellness and spiritual practices, from meditation, to clearing negative energy, to enhancing my communication with spirits and nature. Cannabis is regarded as a plant that holds all four elements of nature, and a favourite ritual of mine is to take long walks in the woods, channeling the natural energies around me and allowing them to guide my thoughts and creativity when I’m feeling cluttered or in need of guidance. A: Cannabis has been a part of my life since I was a teenager. I’m a very introverted person, so it helped me open up to others and have “mind-blowing” discussions with people I might otherwise be too shy to talk to. I’ve always used it to enhance my creativity when I make art or to help me get out of my head when I have writer’s block. A few years back, I developed PTSD and depression after a trauma, and cannabis really helped me through my therapy and recovery after that. More recently, I’ve been using it to enhance my spiritual work, especially meditation and trance work. I really enjoy integrating it into my daily rune studies, as well as into my yoga practice. What can people expect when they subscribe for a Green Moon Box? V: Our mission is to provide discovery and delight as our customers explore different avenues of spirituality and wellness through cannabis. Each box will contain items inspired by the upcoming Sabbat and is centred on integrating green witchcraft into your current spiritual practices, or just to help add a little magic into your self-care routines with a cannabis twist! 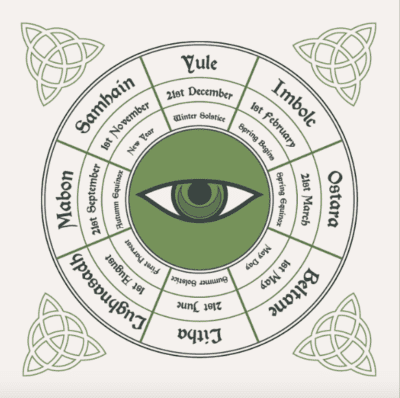 A: Many witches and other neo-pagans celebrate the Wheel of the Year, which marks the spring and fall equinoxes (when day and night are of roughly equal length), the summer and winter solstices (when the days and nights are longest), and the four cross-quarter days that fall halfway between them. The items in our boxes help integrate cannabis products into these celebrations. You may receive items like handmade spell candles, natural rolling papers, or chocolates infused with CBD…but they’re always a surprise! I think that anyone, regardless of their spiritual beliefs, can enjoy celebrating the Sabbats. They are a celebration of the season and a communion with nature…and one of the best parts of nature is the cannabis plant! V: We do not include any cannabis products that contain THC at this time; however, we do provide with cannabis accessories. And there is always a cannabis strain suggestion that will align best to the suggested spell work or Sabbat celebrations. What are you most excited to introduce to women who are just entering the cannabis space? V: We’re excited to offer a new avenue that can change their smoking or consumption experience into something more than just a high. The smokable part of the cannabis plant is female, and when growing the plant you must elevate the female in order to be successful. As women navigating this newly legalized world of cannabis, we can shape and mould it to our wants and needs. Amanda and I were speaking to others about ritualizing the use of cannabis, but we weren’t seeing it out in the world. I would love to see women celebrate the spirit of the plant and utilize that mindfulness when using cannabis. A: I’m really excited to show women that whether you enjoy cannabis recreationally, sporadically, or spiritually, there’s a community of others out there to support you. Got a favourite strain? Or favourite cannabis ritual? V: I tend to gravitate to Sativa’s and hybrids as I enjoy using cannabis while working. My favourite strain is Super Silver Haze, as it both relaxes and invigorates my energy. For meditation and slowing my rapid pace down, I’ll choose an Indica like Hindu Kush. A: For recreational use, I love a bright green Sativa, but for spiritual use, I gravitate to pink Indicas. Pink Kush, Pink Death Star. I’ll take an edible when the sun goes down and meditate on the runes with the most incredible visuals. Both of you talk openly about witchcraft. Can you share a little about how you became witches, and what that means to you? V: Witchcraft can be both a very personal or communal experience. For me it began as a communal experience and moved into personal as I learned and grew. I first dabbled in small acts such as writing my problems down on paper, and then burning it, and asking and visualizing that problem to be worked out. I had other witches teach and practice tarot, reiki and reading crystals with me. I would attend coven rituals, and I began to devour every book I could get my hands on. I noticed my energy was different. I felt empowered. It was fate that drew me to alternative avenues of spirituality, mysticism, feminism and empowerment. 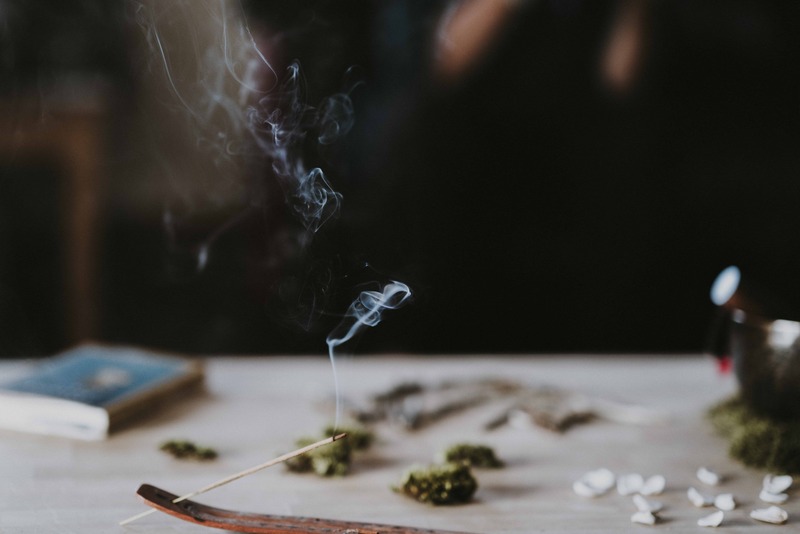 It is now much more personal, and I cater my practices to that of a green witch, using natural materials and energies to enhance my spiritual connections and seek comfort in ancient rituals. A: For me, it was the opposite. When I was young, it wasn’t cool to rub lavender oil on your crystals and leave them outside to charge in salt water under the light of the full moon. People thought I was crazy! So I kept it to myself. The women in my family have been witches as far back as I can trace. My mom took me to metaphysical stores when I was a kid, and we’d try to find the gemstones that gave us the strongest vibrations. My grandmother read me Edgar Cayce predictions and introduced me to the idea of the Akashic Records. We’re mediums and mystics and clairvoyants, and I shied away from it for a long time because I didn’t know anybody else who did that kind of thing. I wasn’t really aware of the wider community. What does your wellness/self care routine look like for winter? V: I enjoy staying close to nature, tending to my plants and herbs. I continue to take meditative walks outside with my vape or a crystal pipe, even on the coldest days. It’s a reminder that I’m part of a much larger eco-system that I must cherish and protect. I’ll charge my cannabis with a crystal, choosing one that is based on my intent. For instance, if I want to dispel negativity, I may pair my cannabis with a black tourmaline crystal when storing it. I also use lots of essential oils, especially jojoba oil, all over on my skin as it gets very dry in the winter months. A: I have Seasonal Affective Disorder, so the winter can really get me down. I try to be very gentle and remind myself that the dark half of the Wheel of the Year is about rest and introspection. I meditate at lunch by the window, or wrapped up in a blanket on the balcony, to make the most of the sun that we do get. I bring the light inside with a lot of candles and take a lot of salt baths with essential oils to keep my skin soft. What goals are on your mind for 2019? V: Getting the word out! Green Moon Apothecary is a small business, and word of mouth is our most powerful marketing tool. We’d love to see our dreams take off! You best believe we’ve been doing success spells to push us along. A: We’d also like to extend our presence in communities, be part of some events in Toronto to showcase our wares, chat with people in our community, and even offer to read runes for people or help select a crystal that’s right for them! V: If you are interested in learning more about adapting cannabis into your wellness or spiritual practices, we are always adding to our blog on greenmoon.ca. A: We also love to support other Canadian, women-run companies and add them to our circle! If you have a product that would be a great feature in our subscription box, we’d love to learn more. Reach out via our website! Check out Green Moon Apothecary on Facebook, Instagram and Twitter. And if you haven’t already, enter the contest we’re running for a chance to win a half-wheel subscription!